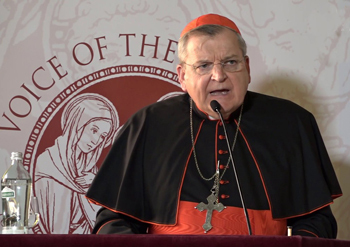 TIA Note: For the convenience of our readers we broke an article by Mrs. Cornelia Ferreira titled “Fatima through the Lens of Vatican II: As Illustrated by Raymond Cardinal Burke” into a series of three smaller articles. Her piece is a lucid analysis of Card. Burke's speech about Fatima on May 19, 2017. The titles of these three articles were chosen by TIA’s editor. A few words of transition at the end and beginning of the articles were duly added to the original written text. A.S.G. Here we go again – Fatima suffers another round of distortions and doubletalk, courtesy of Cardinal Raymond Burke’s May 19th speech at the Rome Life Forum. In established modernist style, it is an intriguing blend of truth and novel errors. Rash euphoria greeted reports of his talk, entitled “The Secret of Fatima and a New Evangelization,” but sober analysis of his actual words reveal a disturbing picture. First, some background: the talk took place during the Jubilee Year of Fatima (November 27, 2016-November 26, 2017), a year featuring countless projects commemorating the Fatima Centennial. Now, as observed, in the special “Years” celebrated by the Holy See, the object being honored is simultaneously subjected to a revision and an “updating” that weakens traditional beliefs and practices. It is in this context that we look more deeply into the Cardinal’s sudden call for the Collegial Consecration of Russia to the Immaculate Heart of Mary. Is it a “vindication” of Fr. Gruner as some claim? Not so fast. This is doublethink – the holding of two opposing ideas at the same time. In communist dialectical terms, it is the synthesis of a thesis (Consecration not done) and antithesis (Consecration done). Perhaps the reason he feels obliged to repeat the Party Line that the 1984 Consecration was acceptable is because the alternative would constitute the “thought-crime” of holding incomplete “Consecrations,” even by “sainted” Popes, have been acts of disobedience towards Our Lady and the Holy Trinity Itself (present at her 1929 request); (b) the faithful have been systematically deceived about their validity; and (c) Communism is not dead and the errors of Russia underpin the post-conciliar Church. 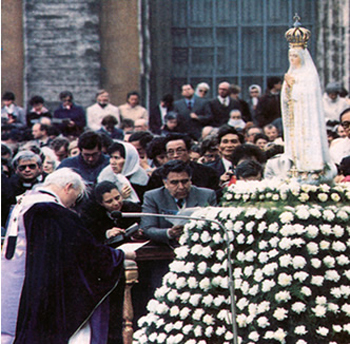 “Renewing the consecration will probably, over the years, become something that is done with some regularity and with great solemnity” - in fact, “an annual consecration.” Directed toward the conversion of Russia to the Catholic Faith, Fatima has long been a stumbling block for ecumenist bishops and Popes who have “anathematized” proselytizing; further, they attributed the fake “death of Communism” at the Soviet Union’s controlled demolition to the “successful” (though invalid) 1984 Consecration. This brings us to another major thrust of Card. Burke’s address: Fatima is intertwined with the “new evangelization.” This dialectical claim is a serious affront to Our Lady of Fatima. We will see why in the next installment.